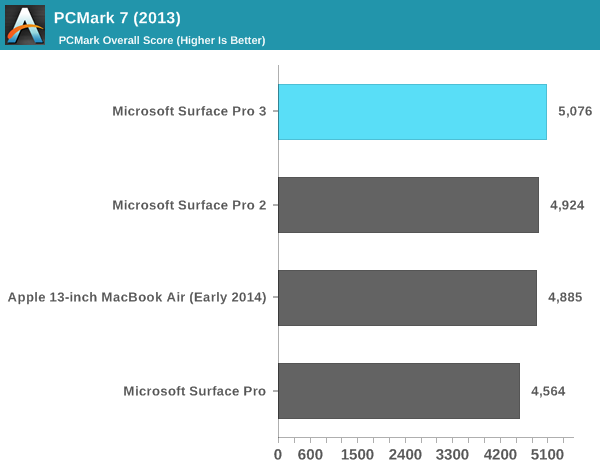 Just like with battery life, we need to evaluate the performance of Surface Pro 3 as both a laptop and a tablet. 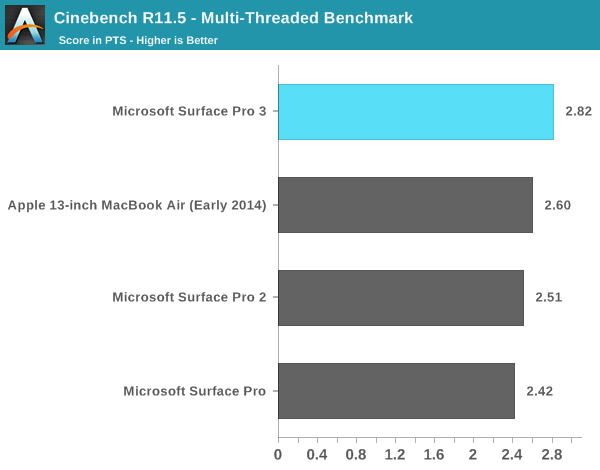 As a laptop, Surface Pro 3 delivers performance comparable to other Ultrabooks of similar specs - assuming we're talking about short bursts of performance. In prolonged workloads you'll see a bit of a gap, and even a slight regression vs. 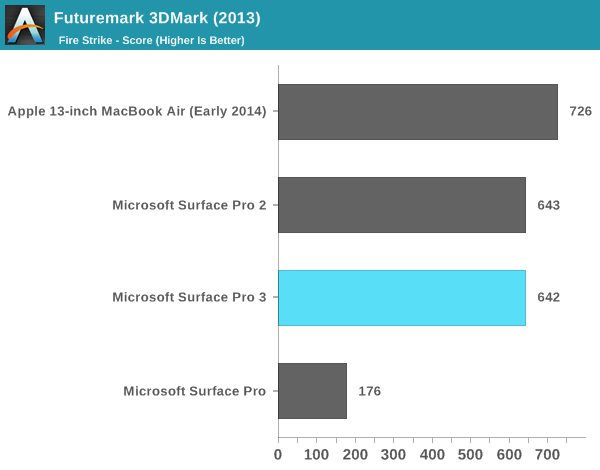 Surface Pro 2 due to the thermal design targets for the new chassis. 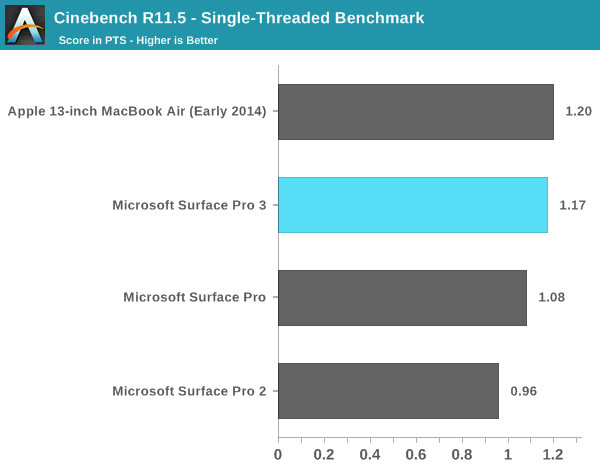 With the exception of the Work suite in PCMark 8 v2, we're mostly looking at performance in the range of a 13-inch MacBook Air - the prototypical Haswell ULT notebook. 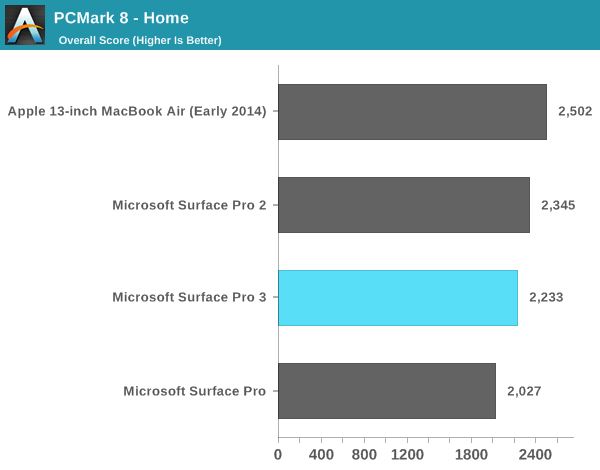 Surface Pro 3 is definitely in good performance company. 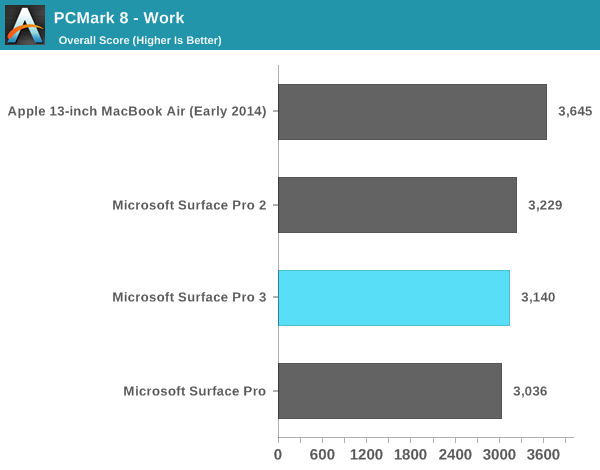 In the Work suite however the MacBook Air (running Windows) is able to deliver around 16% better performance than Surface Pro 3. I'm guessing this has to do with thermals more than anything else. In terms of playable games, with some tweaking to detail settings you should be able to average 30 fps in titles like Dota 2. Running at the panel's native resolution is generally out of the question but for lighter titles on Steam like Transistor, you can have a reasonable experience. The higher end Core i7 Surface Pro 3 does ship with Intel's HD 5000 graphics instead of HD 4400 in the Core i5 review sample I tested. 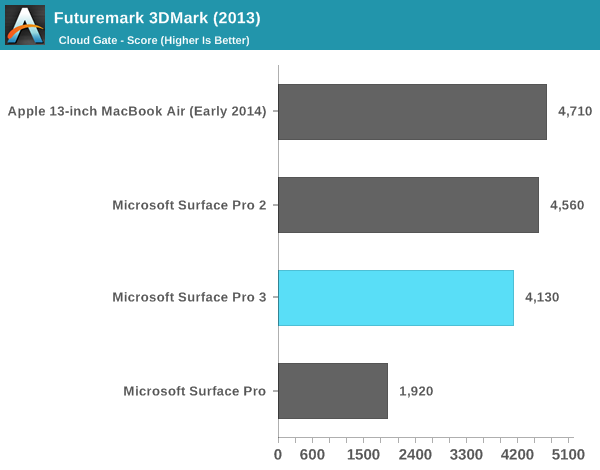 It's entirely possible that we see better gaming performance or thermal management (more EUs at lower voltage) in that design. 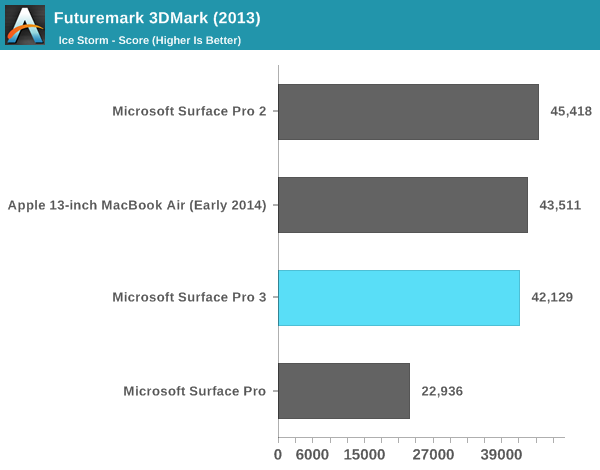 Just like in previous designs, Surface Pro 3 integrates a SATA SSD (likely M.2 this time). In this case Microsoft uses an OEM version of Samsung's SSD 840 EVO, a 3-bit-per-cell MLC design that we've found to be a pretty good value. I am disappointed we didn't see a move to PCIe storage but for general use I doubt there's much value in it. 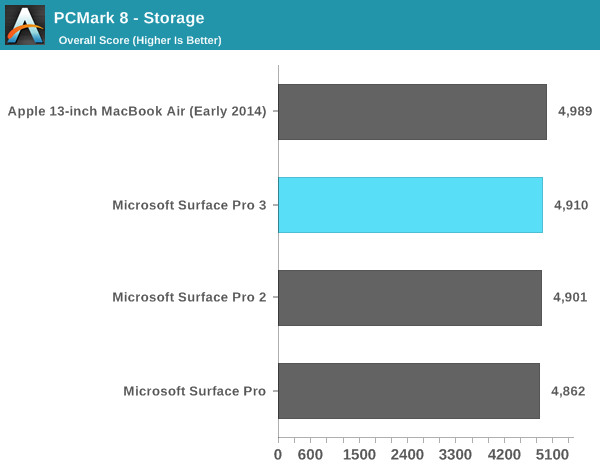 PCMark 8 v2's storage test isn't particularly stressful but it does show that Surface Pro 3's SSD is at least competitive with its predecessor and the MBA despite moving to TLC NAND.